I have decided to do something very different this time, I have taken Christmas pattern number a284 and made it into a everyday day card which is available from Ann's Paper art, just shows you how versatile Ann's Patterns can be. The pattern is simple but beautiful and the beads really make it come alive. I made this birthday card for a lovely lady by the name of Sue we all know her by Supernan. 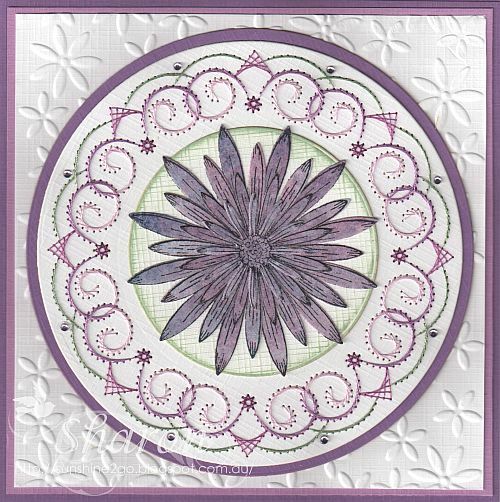 Again I have used one of the wonderful new dies by Ann, Stitching Stencil AND001. It has 2 elements and I have used both of them. Decoupage is Marianne Design 0076. 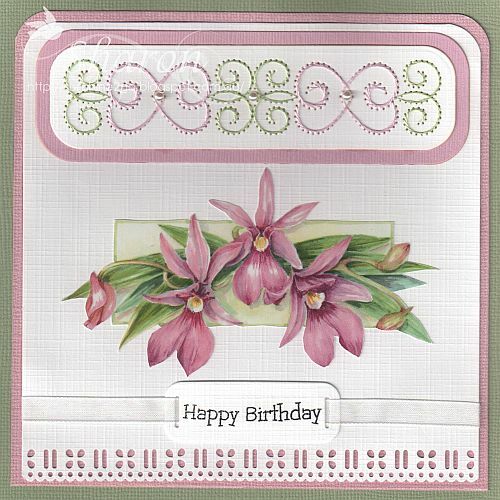 Happy Birthday stamp is from Lili of the Valley which I have stamped onto Nellie Snellen mfd008. Martha Stewart Embroidered Floral punch was used along the edge of the card. My exchange card for the month of May was for Frances. 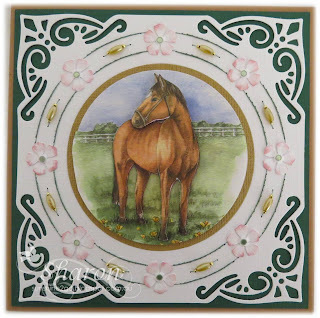 I thought that it was a wonderful opportunity to use the new Stitching Stencils from Ann. The stencil number is AND004 and comes with many elements, which I have used 3 of them on this card, the stitching and the 2 outer circles. Threads are Mettler Polysheen 2822, 2912, 2830, 2650. 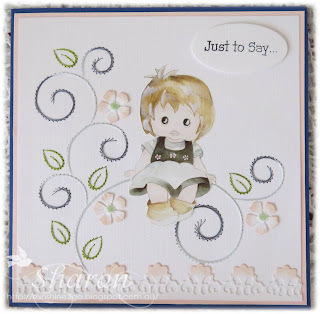 Delicate Asters HCPC3494 stamp by Heartfelt creations was stamped onto coloured cardstock and then die cut with the Spellbinders, Delicate Asters HCD726. The combination makes such a beautiful flower when used together. The inner circle die is byNellie Snellen mfd057 which I have gentle inked. Spellbinders M-Bossabilities EL-005 has made a perfect background for the card. Gems have been added around the stitching. This card was made for my daughter Nicole, it is her birthday today so I can show you all. 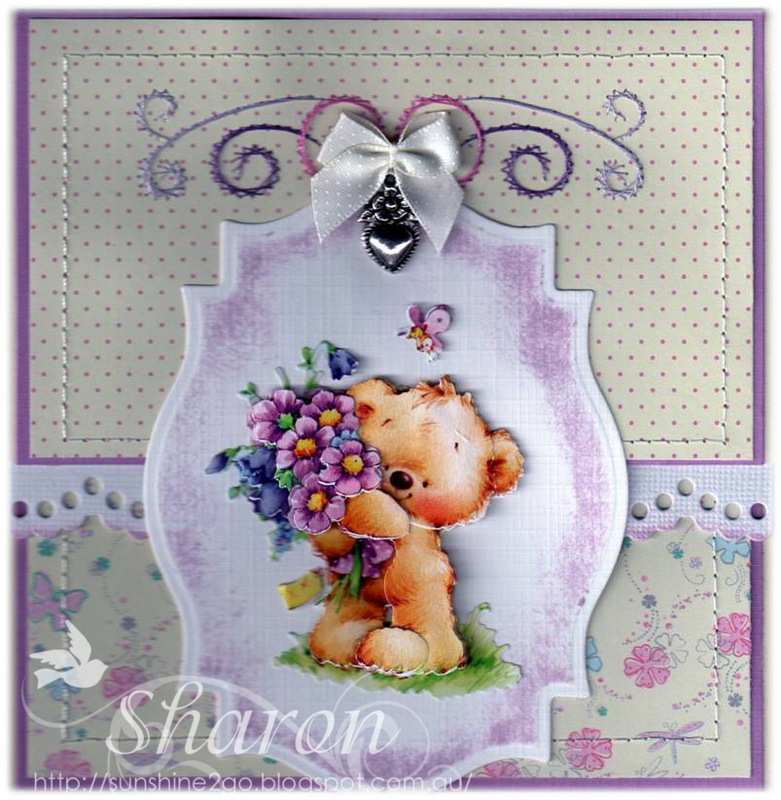 The lovely little heart charm is by Marianne design, which is under the Forever Friends little bow. The cute decoupage by Reddy creative cards-82181 fits perfectly on the spellbinders S4-310. I have attached a lovely lacy die by Nellie Snellen mdf023 along the back of the bigger die. Distress ink has been gently sponged around the edge of the die cuts. I have stitched around the edge of the Me to You patterned papers with my Tim Holtz idea-ology ruler. Here you can see what the card looks like when it is open. 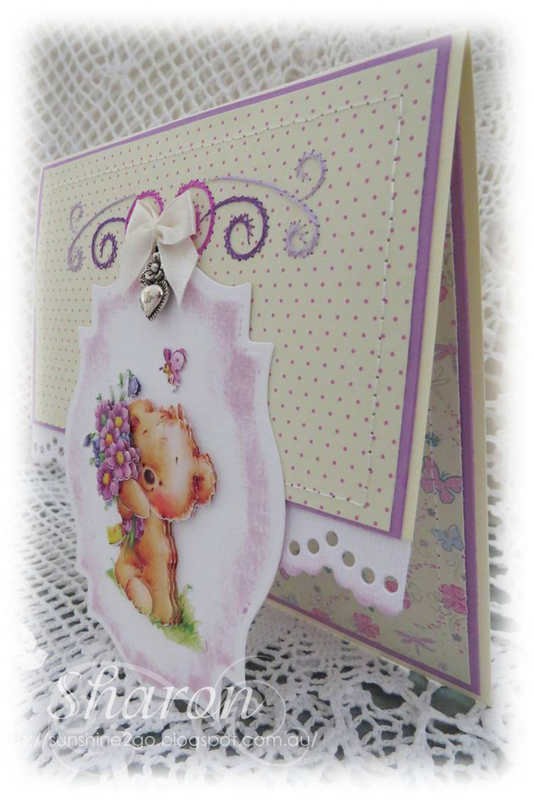 I really enjoyed making this card, it was lovely to make something different for a change. It was Petra's birthday during April, this is the card that I made for her. The pattern is again from Ann's Paper Art a674. Threads are Mettler Polysheen 5664, 3251, 2166. Tim Holtz distress ink has been used to add colour to the die and the punch.